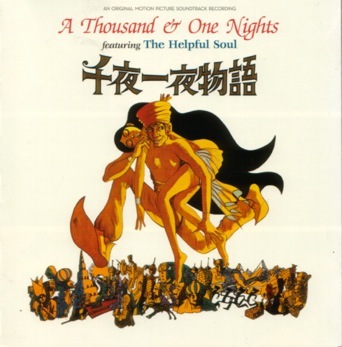 The 164th Soundtrack of the Week is A Thousand & One Nights, a 1969 anime version of the famous Arabian Nights stories with a dramatic score by Isao Tomita and rock songs by The Helpful Soul. The "Main Title" is a beautiful piece for orchestra and chorus and recalls the work of Hollywood Golden Age composers such as Franz Waxman, Bernard Herrmann and Miklos Rozsa. It's really great! Things change right away with the second track, "Aladdin's Theme". It starts out with an acoustic string instrument and hand percussion but then the fuzz guitar and electric bass guitar come in. Must be The Helpful Soul! There are ethereal wordless vocals and occasionally lyrics ("Aladdin, Aladdin"). "Lovely Milliam" features another sumptuous orchestral arrangement in the mood of the "Main Title". The harpsichord is used well. "An Enchanted Night" continues this theme with violin taking the lead. "Plundering of a Slave" reminded me of some of Peter Thomas's outer-space action music. There are blaring horns, driving hand percussion and busy strings. The Helpful Soul come back for "The Torture" with a sludgy bass and drums groove and sick fuzz guitar. The singer mostly moans, perhaps giving voice to a torture scene on screen. Near the end he starts screaming "Somebody help me! Help!". Keiji Haino could cover this piece. "The Dance of the Bandits" finds The Helpful Soul in an upbeat mood, with the guitar opting for less fuzz on top of a sprightly groove from the rhythm section. Again the singer expresses himself more in sounds than in words. This time he seems to be doing animal noises. "Media's Theme" is a laidback and groovy instrumental from The Helpful Soul. The guitar sound is clean this time, with a touch of reverb. The orchestra returns for "The Flying Wooden Horse". They start out in Peter Thomas mode again, with the reverberating horns up front, but then the strings take things in a different melodic direction. The chorus begins "The Love of Jallis" with gentle support from a few of the orchestra's instruments, notably the harp. Other instruments gradually join in and create a swirling and wistful atmosphere. "Cheerful Aladdin" has The Helpful Soul returning to its "Aladdin's Theme". "The Contest of Plundered Treasures" funds The Helpful Soul in a Black Sabbath sort of groove, though nowhere near as heavy. It's an instrumental piece with fuzzed-out guitar. The band gets upbeat again for "The Horse Racing". The singer this time is doing a lot of "Hup-hup, ya-ya" sort of stuff. More fuzz guitar. The bass guitarist does some cool embellishments. "The Construction of Aladdin's Tower" is an instrumental version of "Aladdin's Theme". The "End Title" is a reprise of the "Main Title", a superb piece.